Everything around us seems to be signalling that summer is coming to an end. Children are heading back to school and Labor Day is just around the corner. But the weather here is still bright, sunny and warm. So I feel basking in the goodness of summer just a little bit longer before we officially switch gears towards fall. I hope you’re with me because there’s a delicious strawberry cake recipe coming your way later in the week. Plus, today’s featured cake design is an absolute ray of summer sunshine! 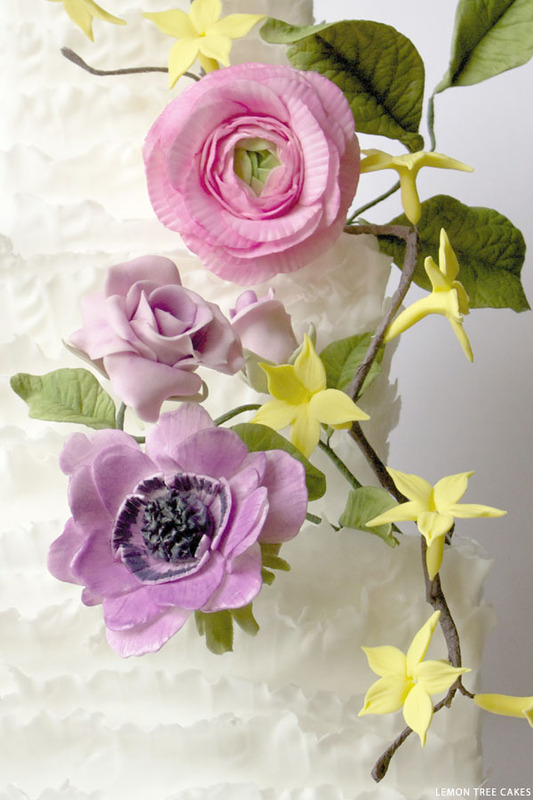 In hues of purple and pink, today’s cake was inspired by the beauty of summer and features a gorgeous arrangement of hand-crafted sugar blossoms. Gracefully cascading down the front of the cake, this delicate mix of florals perfectly complements the wispy fondant frills which lay underneath. 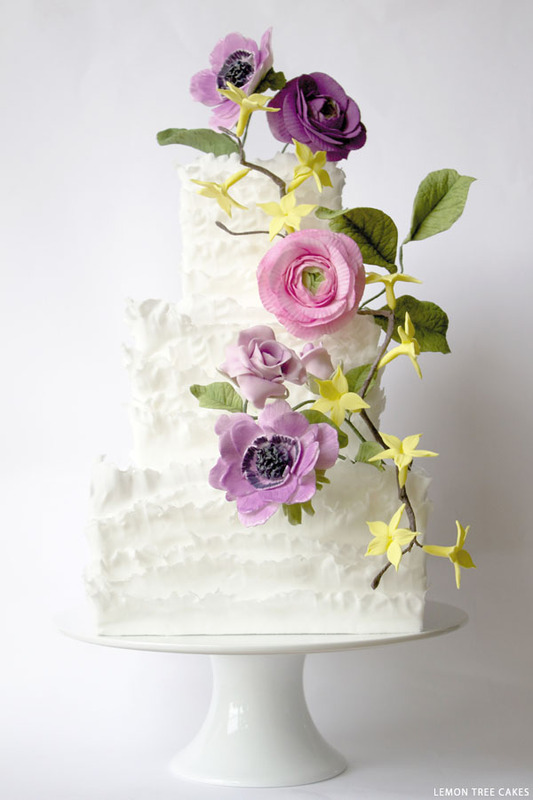 It all comes together in such an exquisite way, creating a lovely cake that is sure to stand out at any summer wedding. It comes to us from Pam Jones of Lemon Tree Cakes in London and I have a feeling, just one look, will brighten your day! A huge thank you to Pam Jones of Lemon Tree Cakes for inspiring us with her elegant wedding cake design today. It is delightfully dreamy beyond words! « Does Sifting Make a Better Cake? I would love to have atutorial on this embossment ( the white cake ). I’m loving the texture of the cake. It’s so simply elegant! I just want to thank you all for your lovely comments. The white fondant has been frilled after running it through the pasta machine.